Hundreds of people protest on the West Bank and in Gaza for the third day in a row. Palestinians angry at Donald Trump's recognition of Jerusalem as Israel's capital again protest. 2018-04-9 The Palestinian Authority pays salaries to its West Bank staff but not to staff in the Hamas-controlled Gaza Strip, amid growing disputes between the two groups. 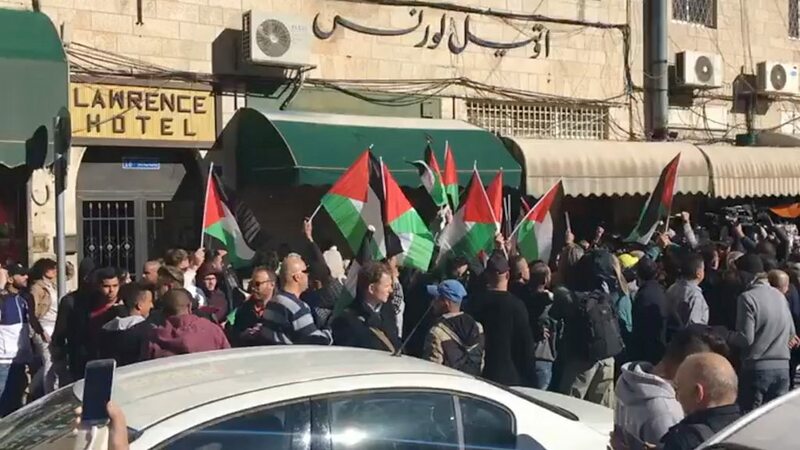 2017-12-8 Clashes erupt in Bethlehem and Hebron. Dozens of people throw stones at Israel Defense Forces who reply with tear gas and water cannon. More than 200 people are wounded. One person was killed. The Health Minister of the Palestinian National Authority named the man killed on the Gaza Strip border. 2017-12-6 U.S. President Donald Trump recognizes Jerusalem as the capital of Israel and says the U.S. starts the process of moving its embassy from Tel Aviv to Jerusalem. The United States Department of State issues an internal travel warning to Israel, Jerusalem and the West Bank until December 20. The U.S. embassy in Amman temporarily suspends routine public services and stops embassy travel around Jordan. Embassies in Berlin and London issue vigilance warnings to U.S. citizens. 2017-10-12 Palestinian factions, Hamas and Fatah, sign a unity deal in Cairo, that is also publicly supported by the governments of Egypt and Saudi Arabia. The Fatah-controlled Palestinian National Authority (PNA), along with Israel, currently govern the West Bank. According to the signatories of the deal, the PNA will take administrative control of the Gaza Strip, and, along with Hamas, police its borders. The signatories consider the agreement a first step, and, if productive, plan to meet next month to address the remaining issues. The government of Israel opposes any involvement by Hamas in a Palestinian government. 2017-09-17 Hamas, through Egyptian-mediated talks, agrees to dissolve its Gaza administration, hold talks with the Fatah West Bank government, and hold elections for a Palestinian unity government.